Written by Catherine Bush, a prolific playwright based in Virginia, this adaptation is largely true to the novel, in so much as a 600-page opus can be condensed to about 90 minutes of performance. This means that the show’s cast of 17 often assumes multiple roles, although it’s not the first time in theater history that actors have had to scramble out of one costume and into another. Besides which, the single set has to accommodate (with minimal lighting and prop changes) some 20 locations. 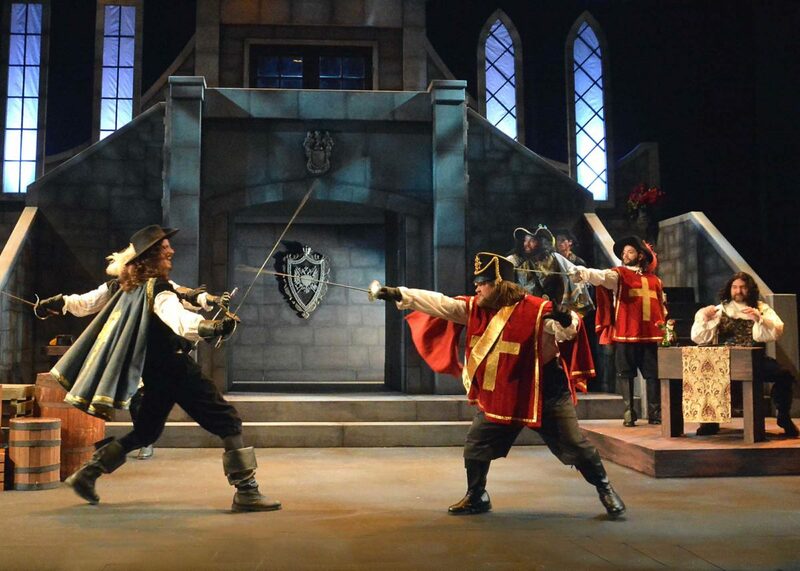 Directed at a brisk pace by Orestes Arcuni, “The Three Musketeers” doesn’t dawdle. Arcuni helmed last season’s “Picasso at the Lapin Agile,” but this production is a better showcase for his skills at making sure actors are always on the move, emerging from one corner just as others slip into the wings. That can’t be an easy task that ends up looking so seamless. 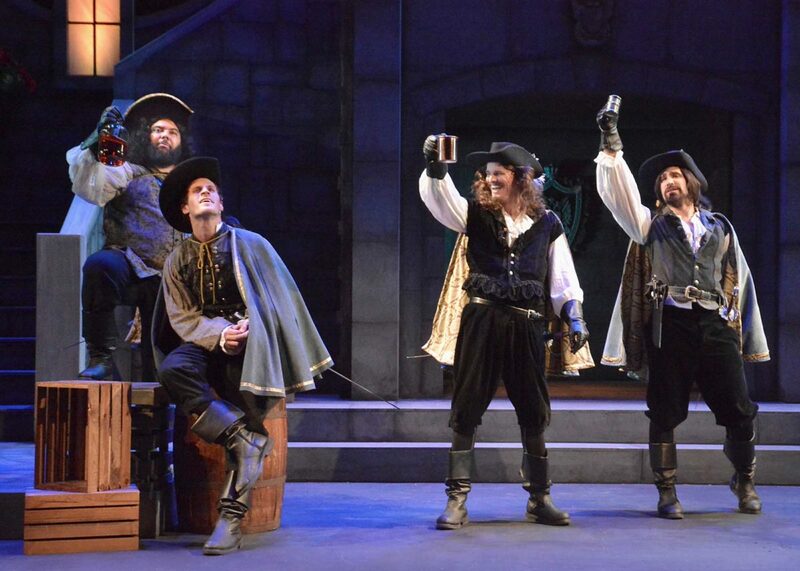 Ostensibly, the stars of the show are Ross Hellwig as Athos, Justin Ray as Aramis, and Henry Alexander Kelly as Porthos, the title’s intrepid trio. And stars they are, buttressed by Connor Sullivan as D’Artagnan (as the novice musketeer) and Erik Gratton as Rochefort (spying for Cardinal Richelieu, the latter acted with a certain gravitas by Skip Pipo). Local audiences will recognize Patrick Vest (Monsieur de Treville), who appears often with Shakespeare by the Sea and Little Fish Theatre. If on occasion the other actors have performed in the South Bay then I must have been asleep. What is the story about? Answer: the fourth musketeer. D’Artagnan is a country bumpkin from Gascony who arrives in Paris with a letter of introduction from his father for Monsieur de Treville, the Captain of the King’s Musketeers. The letter is stolen before that happens, but the somewhat pushy or insistent D’Artagnan doesn’t give up and go home. Eventually he befriends Athos, Aramis, and Porthos, and becomes one of them: All for one, and one for all. There are also subplots, the most prominent involving Richelieu’s spy Rochefort, and Rochefort’s spy Lady de Winter (Krista Curry). The intrigue here centers on Anne of Austria (the French Queen, wife of King Louis) having an affair with England’s Lord Buckingham. The Cardinal apparently is pushing for war between England and France and there’s a great deal of hubbub over missing diamonds, etc., which we don’t need to go into here. 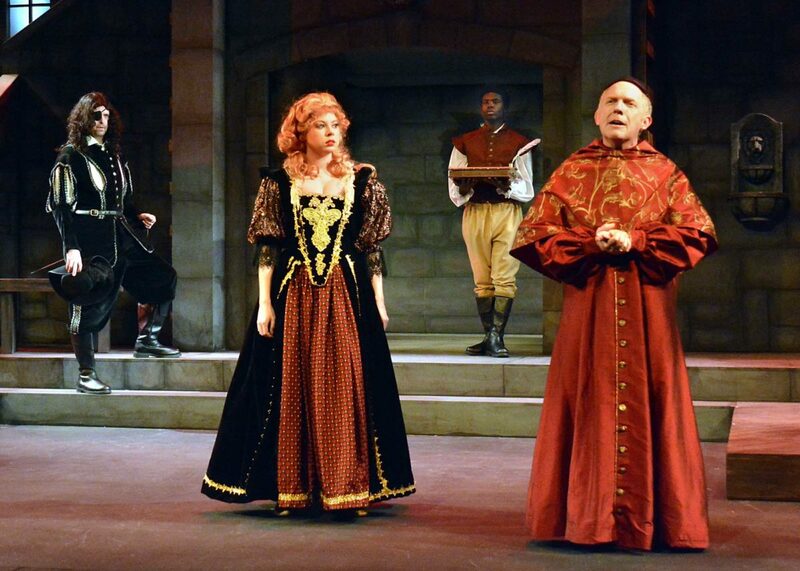 Anne of Austria, who doesn’t seem to have made it into the program’s “In Order of Appearance,” is played by Aja Gomez; the King is played (rather foppishly) by Paul Stanko; and Buckingham by Aaron McGee. The ensemble in general does a commendable job of acting, with Pipo (as Richelieu) giving a stronger sense of authority to his role. I mention this because the acting in general is somewhat campy, free and loose. Despite the air of levity, there are some startling moments that bring the play down to earth. But the pace doesn’t allow for many of them. “The Three Musketeers” hasn’t any muskets, but it does have plenty of swords, and swashbuckling fight scenes to go with them. In addition to his role as the villainesque Rochefort, Erik Gratton also choreographed the fight scenes, and the swordplay is fairly convincing. The playwright has apparently taken a number of liberties with the novel, one of them being that D’Artagnan’s true love, Constance Bonacieux (Carene Rose Mekertichyan), is herewith the daughter of D’Artagnan’s landlord (another role for Paul Stanko), whereas in the book she’s the man’s wife. Adultery, therefore, is banished from the boards. “The Three Musketeers” is certainly entertaining, although a few plots points and twists may be hard to keep track of. But, that said, it’s a glossy work without resonance that probably won’t linger with the viewer once the lights have gone up and people have walked back to their cars. Not to slight this production, which seems to have been well received by the audience with whom I attended, but I feel that a better home for this work would be on a college campus.